Uform has introduced two new smooth painted finish doors in 21 colours to its Kitchen Stori collection. The introduction of the new product ranges follows extensive market research says Uform, with painted furniture and kitchens in particular proving to be one of the top interior trends. 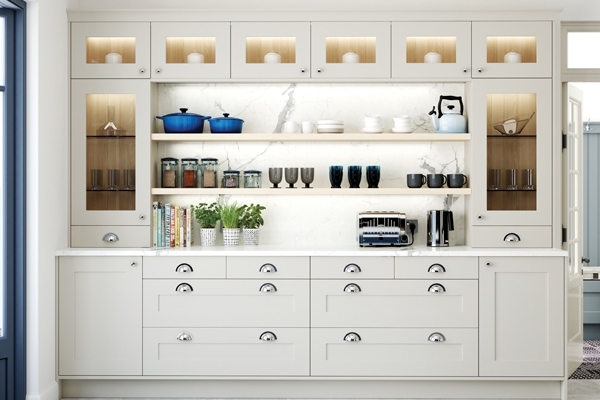 The Florence and Georgia ranges are the latest offerings under the Kitchen Stori brand and come complete with a range of accessories allowing consumers to achieve statement pieces of painted kitchen furniture with almost endless design possibilities. Both ranges include accessories such as beaded end panels, modular pilasters and quadrant mouldings all allowing for individuality in terms of design and overall look, with pastry benches and spice racks among some of the pieces that can be achieved. Both new styles are 18mm routered doors, the Georgia range is a classic shaker style door while the Florence range varies slightly with the incorporation of a subtle internal bead around the centre panel of the door. Manufactured using MDF Plus, this provides a stable material that is finished to an exceptionally high standard through Uform’s own automated paint line. The pallet of 21 colours incorporates a range of both dark and light tones including muted and earthy shades that, says Uform, are currently hot on trend. Four popular colours are available ex-stock in the Georgia and Florence range, namely Porcelain, Light Grey, Mussel and Stone. “We are delighted to bring these new product offerings to the market and are confident that our new portfolio will offer not only end consumers an extensive range of design possibilities but also kitchen retailers the opportunity to sell ranges that offer value, convenience and choice in terms of lead time and colour.